Skin Care, Bath & Body. HON Motivate Sled-based Stacking Chairs, Shadow - HONMS101SD. This Product Is On Sale For A Limited Time! Product Code: SZHONMS101SD Stock Status: In Stock & Available. Shop Our Store With Confidence! Product Features: Part of the Motivate seating collection by HON, these sled-base stacking chairs with glides can transform any space into a dynamic environment. The Motivate collection includes tables and seating that work together seamlessly to provide a comprehensive solution perfectly suited for any collaborative environment. The way people work is constantly evolving, and Motivate provides the comfort, flexibility, technology and quality they need to get things done. Sculpted for incredible comfort, the high-density plastic shell back and seat of these mobile stack chairs are contoured to conform to your body and move with your body to reduce pressure points. Weight capacity is 300 lb. One-piece propylene can be easily wiped down. Efficient footprint and versatile design deliver comfort and adaptability. 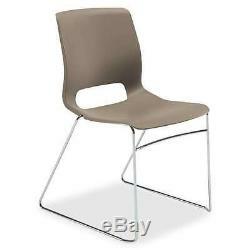 High Density Stack Chair, 23"x21"x32-1/4, Shadow. Overall Dimensions: 23"(L) x 21"(W) x 32.3(H). You will be responsible for taking it off of the back of the truck, so please be prepared move the unit into its final destination. We are a Boston-based store dedicated to providing you the very best products at the lowest possible prices while delivering the absolute best in personalized customer service. Simply put, we are a small company that specializes in big service. It's just another reason why you always shop freely with ShopFreely! At ShopFreely, we stand by our products and our customers. The few exceptions include unsealed mattresses, assembled or modified products, and clearance merchandise which will note this within the product details. The Return Authorization Number allows the warehouse to identify your return when it arrives and helps us credit you as quickly as possible. Please note that the original packaging must always be used when returning product(s) back to us. At ShopFreely, we know how important it is to provide our customers with a safe and secure shopping experience. We want all our customers to be free from worry and have peace of mind while shopping at a trusted and reputable store. We treat the security of your personal information with the utmost care and use only the most state-of-the-art 128-bit hacker-safe SSL encryption to secure all data we collect at ShopFreely. How do you know when your data is secure? This indicates that you are protected within our 128-bit SSL secure server, where all data is encrypted for optimal security. Powered by Solid Commerce, The All-in-One Listing, Inventory & Order Management Solution. The item "HON Motivate Sled-based Stacking Chairs, Shadow HONMS101SD" is in sale since Wednesday, January 14, 2015. This item is in the category "Business & Industrial\Office\Office Furniture\Chairs". The seller is "shop_freely" and is located in Multiple Locations. This item can be shipped to United States.